I know it isn’t good for you, but I crack my bones and joints incessantly. It’s a perpetual cacophonous sound, one I can’t seem to stifle since I’m cracking them at all times. Neck, back, hips, ankles, toes, knuckles, wrists… I’m. Addicted. Did you know I totally talk to myself? Not like, out loud or super noticeably so or schizophrenic-like, but rather, I ask myself baking questions or chatter my thoughts. And to add to the weirdness, I also write words out on my legs. No one’s ever noticed this except Jessie, who is always asking me what I’m writing. The words don’t have meaning; if I hear something–anything–I could start writing it without realizing I am. And I always write it out in cursive. BTW, I totally think people should bring cursive back. Cursive rules. I’m obsessed with parking my car straight in the driveway. If it’s crooked even an inch, I have to get back in, reverse it, and try re-parking. What can I say? I like symmetry. Oh! Oh! Also, when I fill my tank up with gas, I become OCD about that gas. I start freaking.out. when I notice I’m at a quarter of a tank and the need to refill hits me every time I drive. Don’t even talk about gas tanks 3/4 empty. Not cool, bro. Lately I’m being sooooo lazy with my beauty routine. I love makeup, but I seriously hate putting it on. Ugh. I wish my lashes were permanently mascarafied. Someone invent that please. Sometimes, when I have a mad chocolate craving, nothing sounds better than… drum roll please… chocolate icing. Canned. Stuff is so good. Anyone else obsessed with canned chocolate frosting? Did you know I’ve NEVER had Rocky Road ice cream?! I know, so weird! I’m not a big chocolate girl, so I’ve always avoided it, but after making these cookies, it’s easily going to be an ice cream staple for me. These are chewy, chocolatey and filled with yummy little marshmallows and crunchy, salty walnuts, then dusted with powdered sugar. FYI, when I eat pancakes, waffles, or French toast, they’re submerged in a thick mountain of powdered sugar. I love the stuff. Make them and do yourself a favor. 2. In a large bowl, combine the mix, eggs, and oil until a soft dough forms. Gently stir in the mini mallows, walnut pieces and chocolate chips to blend. 3. Drop heaping Tablespoonfuls of dough 2″ apart on the prepared cookie sheets. Bake for approx. 8-10 minutes, rotating pans halfway through bake-time. Cool for 5 minutes on baking sheets before transferring to wire racks to cool completely. 4. Sift powdered sugar on top of cooled cookies. Store leftover cookies airtight, at room temperature, for 2-3 days. These taste SO good! Super fudgy, crunchy, chewy and totally chocolatey. You’ll love them!! Hayley, we would get along famously. I will back of any parking space if I’m not evenly spaced between the lines. I’ve never had Rocky Road Ice Cream, I crack my toes and fingers all the time-the toes really grosses out my family. I love talking to myself, I’m a really good listener! However, I have caught myself talking out loud in the car. That is one step away from being in public, I’m only slightly worried!!! I see the word fudgy here in your description-thats all I need to hear! I now HAVE to make these!!!! Yay! I’m so glad we’re basically the same because admitting some of this was a little weird. I mean, desserts can only make up for so much weirdness ya know? Lol. Thank you! My oldest son is always cracking his joints like that. Back, neck, hips….I’m so jealous! I can never get *me* to crack like that and I think it would make me feel so much better! OMG! You do feel better temporarily… but then when you have to crack them again, before you do, it’s all tight and tense. Blah, it’s not the best habit to have but it feels so satisfying hearing all those pops! You’ve never had Rocky Road ice cream??? I think you owe it to these cookies to give it a try! 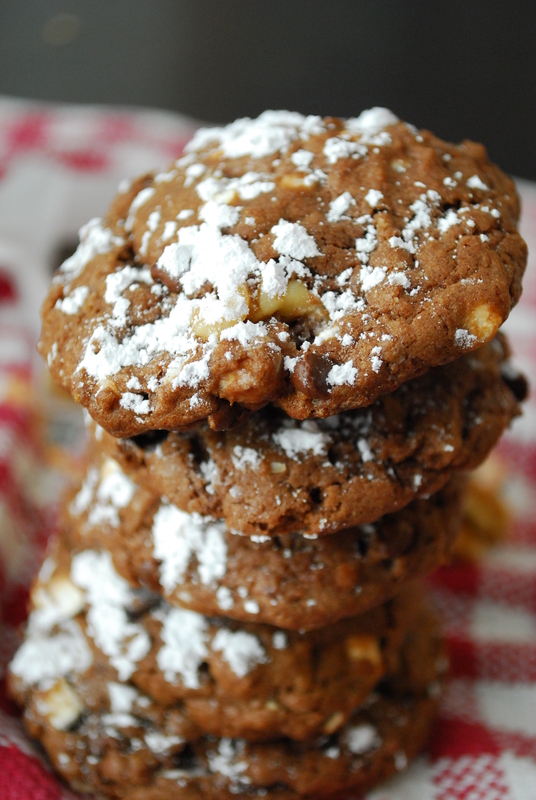 And speaking of these cookies, I love how thick and chewy they look and that you sprinkled them with powdered sugar! I can’t crack my joints, I’m so clumsy I’m scared I’ll accidentally hurt myself. Love the cookies! Haha that’s how my family is! They think it’s going to hurt so bad. I don’t remember why or when I started but now I can’t stop! BTW, do you get the feeling we’re talking about drugs, but in reality, we’re talking about knuckles? Me too. these look awesome!!! craving cookies now! Okay, so I totally can’t deal with the knuckle-cracking. My hubby does it and it freaks.me.out. It’s like I think he’s going to pop his fingers off or something. And I actually do write in cursive most of the time. It’s so much faster! =) Thank goodness Doodle and I planned some cooking baking this weekend because these? Look AMAZING. OK, yum. These look fantastic – but I DO love chocolate, so no surprise here. Also, I was unaware that cursive went away…perhaps I am the last person on earth who stil uses it, haha! The joint popping has to stop, girl. Freaks me out! You would hate driving with me. I always park crooked. I don’t know when this started, I used to be such a perfect parker. I will work on that. Well, seeing as I have to live up to my last name (Parker) I’m like, practically obligated to park perfect lol. Sometimes canned icing is the bomb. I can’t have a can in my fridge, ever. Too funny – Jordan has taken to drawing on her legs. I keep thinking she’s bruised, but nope. Just pen! 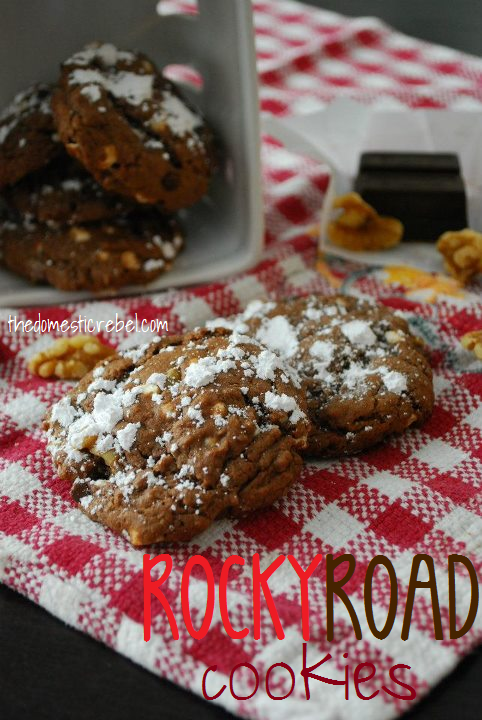 Love these cookies, rocky road was one of my favs as a kid! ACK! NO! Don’t let me see that you crack you bones. No, no, no! Seriously, don’t. No matter what anyone tells you, cracking your bones *does* damage them. I cracked mine in all the places you crack yours and am living proof of damage. I can’t even walk past the driveway anymore due to the damn athrtitis and the pain it gives. I was fine until I got pregnant, then the additional weight and stress on my body triggered something to set it off. I’ve got arthritis badly in all the joints I cracked. 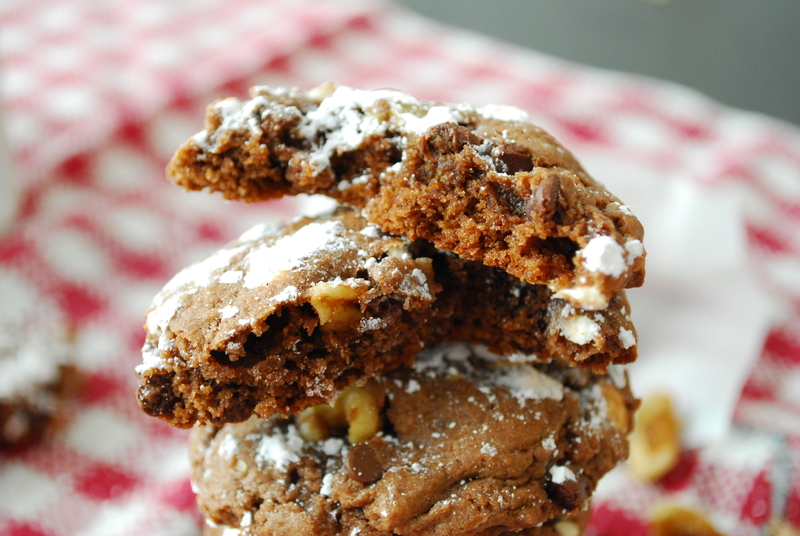 OK, now I’m done telling you off (tut tut), the rocky road cookies look amazballs! I love a chewy, fudgy crunchy cookie. These sound right up my street. Yum! Eeek! That scares me since I know you’re in a lot of pain from what you say on your blog 🙁 I’m going to have to wean myself off–I’m hooked! Blah. Mmmm…these would have tasted good with my Rocky Road ice cream the other night.